Investment Advisors are likely to show you their “fund du jour” and show you how their fund out performed the DOW or the S&P500 or some other well known index. But, be aware. The date that is used as the start date for comparison can significantly change the conclusions one reaches based on the comparison. Below, I present four comparisons; one year, five years, ten years and twenty years. The comparisons use the Dow Jones Industrial Average (represented by the ticker symbol DIA) values. 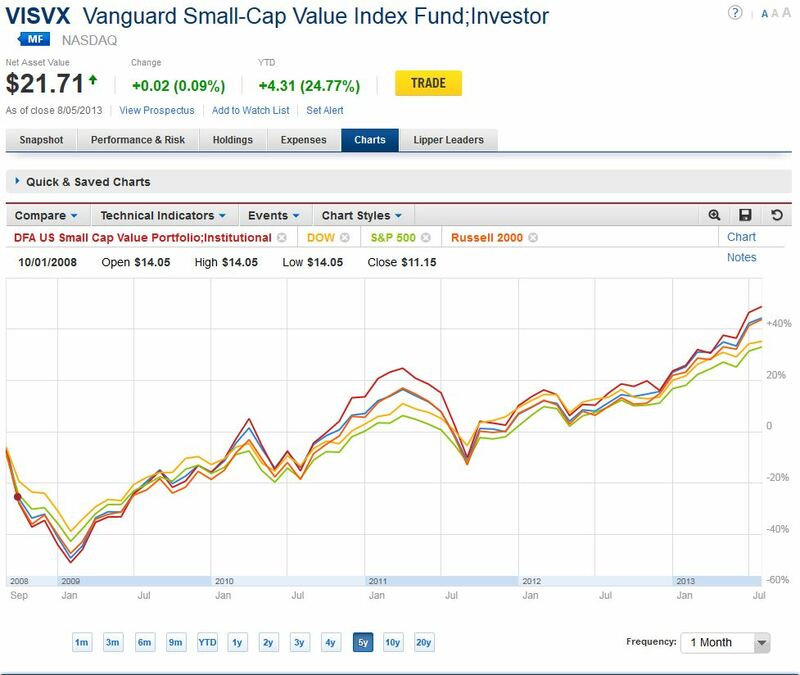 There is academic research that says Small Cap Value stocks/funds do better than “the market”. This research is put to the test. Two index funds will be used for comparison to the DOW and S&P 500. 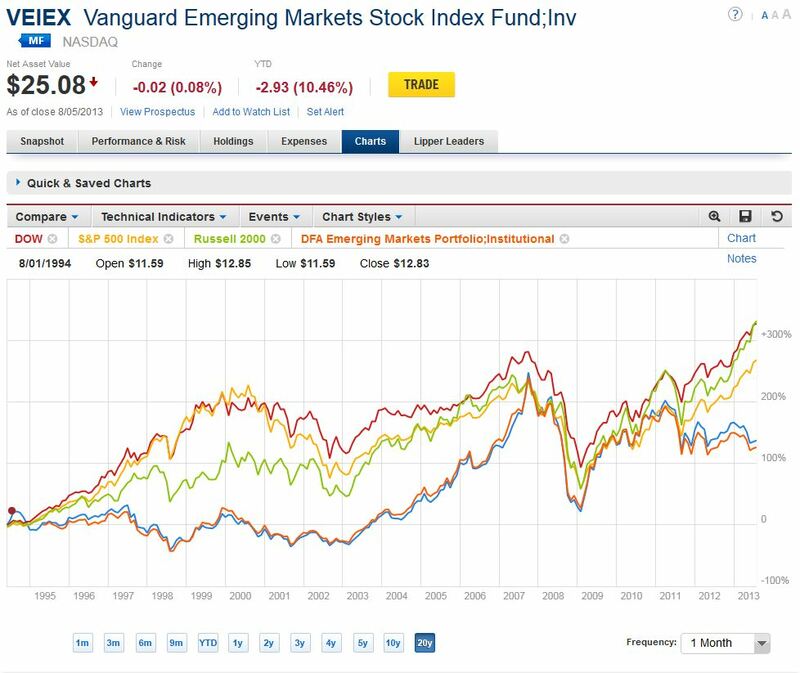 (DFA funds are continuously at the top of Dalbar’s list of “Best Index Funds”). 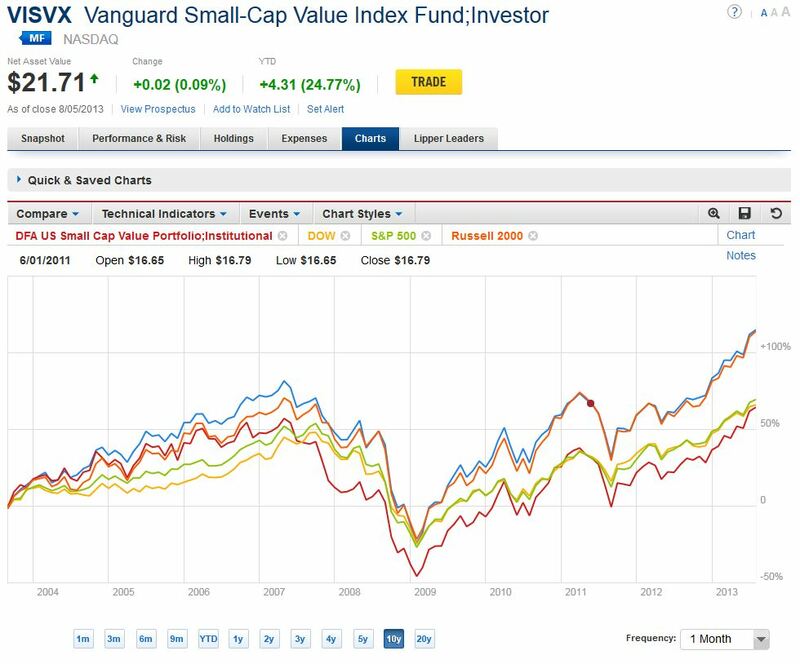 The orange line track the Russell 2000 fund (has 2000 stocks in it). To see a larger image, click the chart. For the one year analysis, DFA and Russell 2000 are neck and neck with the Dow (DIA) and the S&P looking like dogs some 15-20% behind. For the Five Year comparison, the Dow and S&P500 are still trailing but not by so much; DFA is the leader of the closely grouped pack. The 10 year comparison reveals new truths. DFA has fallen to the bottom, even below the Dow and its cousin the S&P 500. 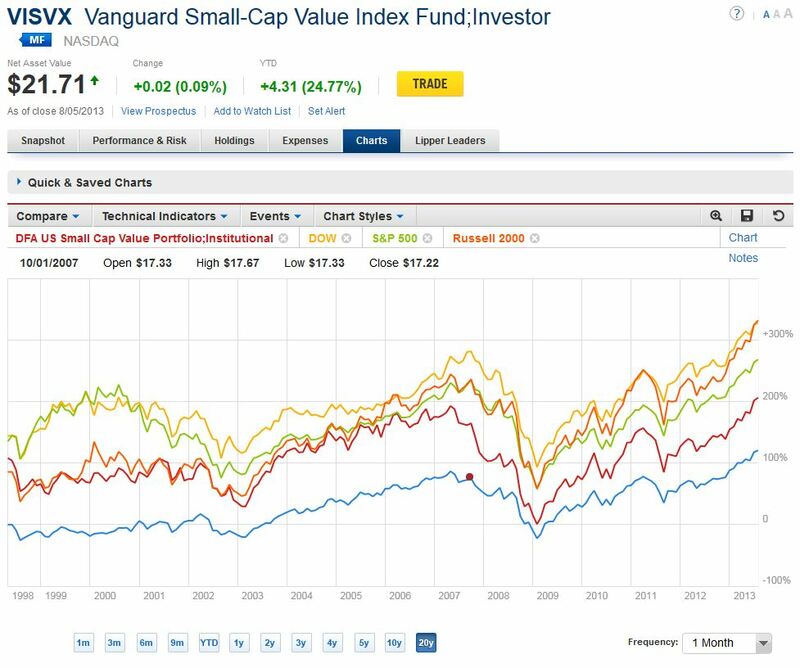 Vanguard is on top closely followed by Russell 2000. For the 20 year evaluation period, the one that matters most to us, things are topsy turvy. 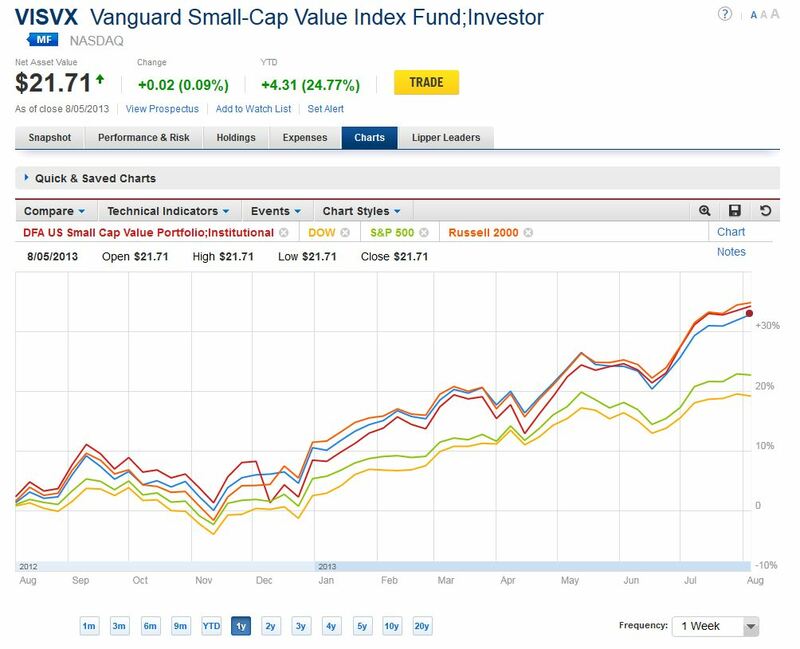 Vanguard is on the BOTTOM, DFA has outpaced Vanguard 2-1. and the Dow is tied with Russell2000 for the top position having outpaced Vanguard 3-1. Remember, we are looking at a very long horizon. It’s appropriate to concentrate on long term performance. 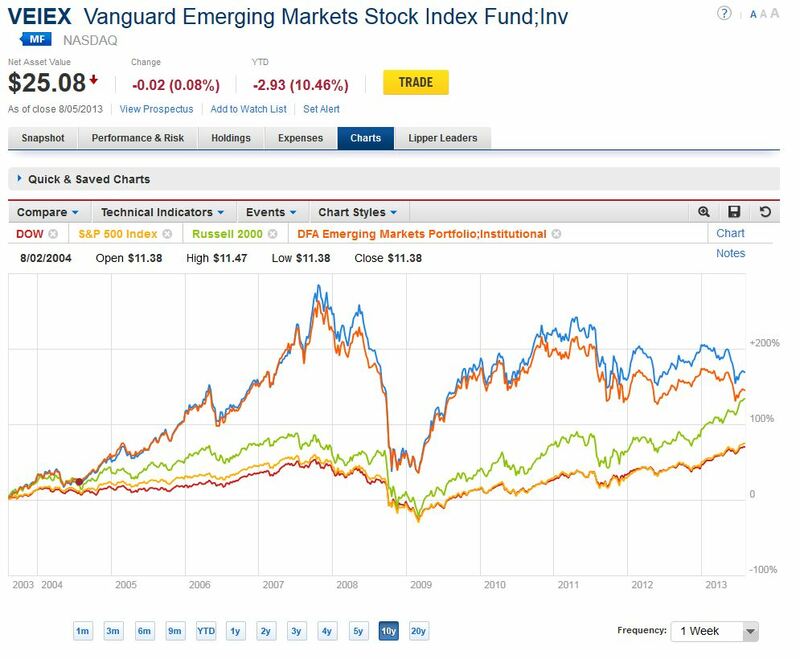 It doesn’t seem to matter what you compare the Dow to… here it is compared to Emerging Markets, a sector that vacillates annually between best performer and worst performer. But look how things change when we look at the performance over 20 years. The working hypothesis of The Plan is that an investment in a fund that replicates the DOW (represented here by DIA), will, in the long run, outperform any other portfolio regardless of what is in it. The comparisons above appear to confirm this hypothesis. The same outcomes occur regardless of what type of security is being compared.